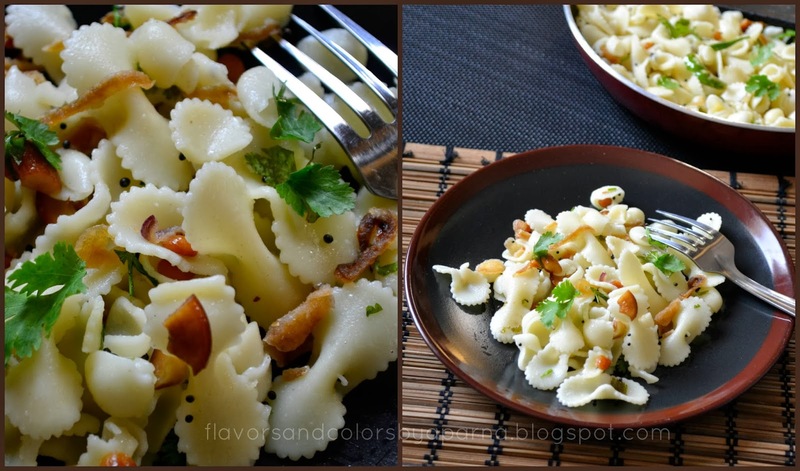 Now why this experiment of using farfalle. One of the weekend my elder one had some rehearsal practice at school and that put me in situation with less time on hands. In such situations, I opt to prepare the easiest as well as filling recipes for breakfast and upma tops the list. As I start assembling the ingredients, my struggle to locate the new packet of semolina which was brought few days back begins. [Yes sometimes the unorganized me ... don't realize the place where I put the stock in a hurry and then face such situations] With not much time in my hands, I grab the packet that was right there in front of my eyes, a packet of farfalle waiting to be used. Kids enjoyed this upma and kept demanding for more! Try this incidental variation and I am sure everyone in family would love it. Boil the pasta in water with salt and oil as per packet instructions. Strain, rinse them under cold water and drizzle olive oil over it. Keep them aside. Heat oil in pan. Add mustard seeds, as they splutter add urad dal followed by chana dal. Fry it till the dals turn red and their aroma is imminent. Next goes in broken cashews. Fry it till they turn light brown. Add slit green chili, curry leaves and sliced onions. Saute them. As the onions turn translucent, add the cooked pasta and mix it thoroughly. Sprinkle some sugar, salt[optional now as we have already added to pasta while boiling them]. 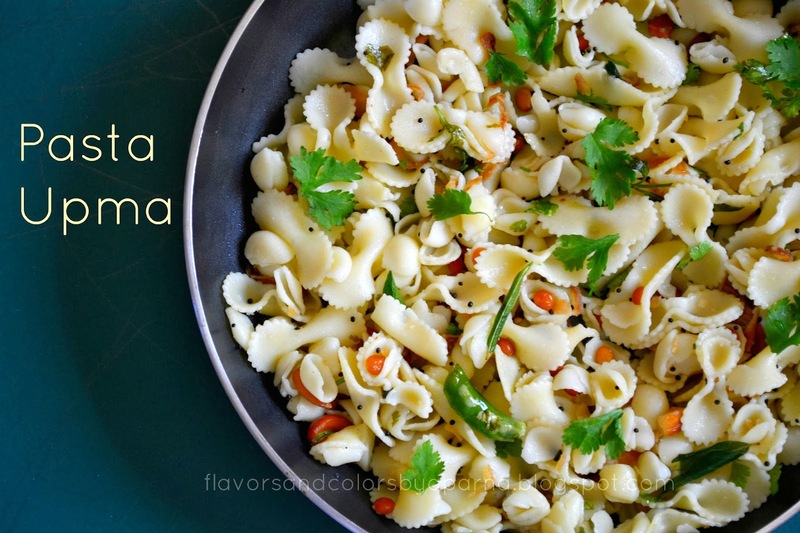 Cover the pan and cook it on low flame for few minutes to let pasta absorb the flavors. Switch off the flame and add 1 tsp of lemon juice. Garnish with finely chopped coriander leaves. [I had some left over caramalized onions from my previous preparation which I used to top this upma before serving]. Serve hot. You can add mixed veggies to this upma and make it more nutritious.